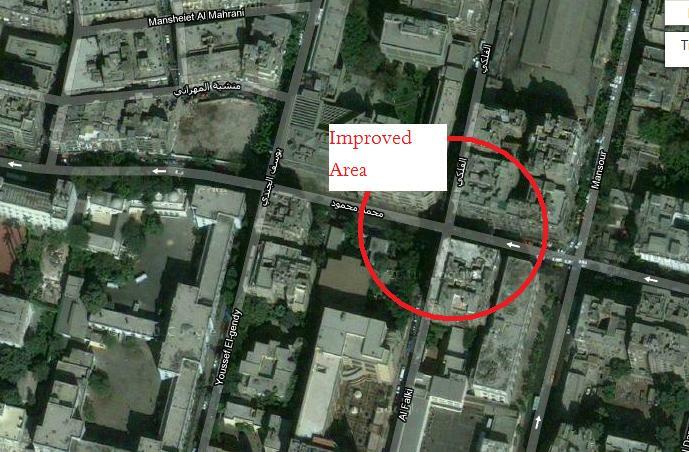 I was walking downtown the other day and I have to say I was quite impressed at what the army has done with the intersection at Mohammad Mahmoud and Fellaki Street. What used to be a drab old street corner before the most recent demonstrations and raging street battles on Mohammad Mahmoud St., has now become an tasteful, chilling reminder of the political tension in the country. Beforehand, the intersection was laughably pedestrian friendly and full of usable sidewalks. Would you believe that you could even pass through, as if it were a thoroughfare made to ease transportation of humans and goods? It was almost like an intersection in a regular metropolis, where people live normal lives under a functioning government. Thank goodness that has all changed, and a small, though not insignificant, portion of the population can fully grasp the eeriness of the current situation in Egypt. Someone in the army clearly has a keen eye for aesthetics, since the piles of barbed wire that now block the intersection have ever so delicately trapped a good amount of rubbish, beneath their delightful spurs. Though razor wire would have obviously been the more luxurious choice, I wouldn’t say the atmosphere loses anything by using its cheaper, more standard cousin. The grey color is also breathtaking and provides a welcome contrast from the brown buildings and black streets. Finally some variation! Another benefit of having the Mohammad Mahmoud Street completely blocked off are the creepy vibes that seem to seep from the numerous, inexplicable puddles and ooze from the silent streets that used to roar with traffic. If you walk for just a moment near the once bustling avenue, you can’t help but get spooked and want to hide and weep! But perhaps the best part about the entire affair is the continual company the soldiers blocking off the street provide. It’s like having riot-gear-wearing houseguests that never leave or talk to you and help intimidate your friends and family. In short, nothing could be more welcoming. I feel like an entire Martha Stewart Living magazine could be written based on this one intersection and the creativity dripping from it. Say what you will about the situation in Egypt, but these people know how to spruce up a place. I’m going to recommend them for my sister’s wedding, but I can already tell you we’ll need a lot of barbed wire and cinder blocks.